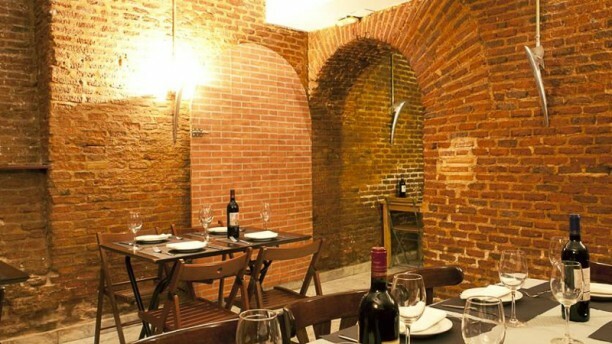 El restaurante Viuda de Vacas, histórico local ubicado en el madrileño barrio de La Latina, prolonga su centenaria trayectoria en la capital española gracias a su buen hacer en cocina tradicional de mercado, utilizando productos frescos de temporada para elaborar platos de origen popular. La cocina tradicional madrileña y segoviana de este establecimiento familiar se traduce todavía hoy en día en Callos a la madrileña, Gallina en pepitoria, Rabo de toro, Judiones de la granja. Su propuesta culinaria no se ha cerrado a especialidades de otras regiones españolas e internacionales: Gazpachos y Salmorejo andaluces, Bacalao a bras de Portugal, Pulpo a feira, Fabes con almejas y Arroz murciano dan buena muestra de ello. Además, el restaurante Viuda de Vacas cuenta con excelsas carnes y pescados frescos además de óptimos vinos españoles. Cuando el sol cubre Madrid, te podrás sentirte un privilegiado en su terraza exterior. ¿Te lo vas a perder? Great old fashioned restaurant. Reasonable prices, great nice owner and wonderful atmosphere for a business lunch. Se come como en casa.... un imprescindible!!! Went for lunch. Very friendly owner. Had chickpea and spinach soup and bacalao. Both were good, simply made and tasty. Well worth a visit. Best traditional food we had in Madrid, squid croquettes not to be missed. Amazing atmosphere and the best cuisine in this town for sure. Most recommend. Really nice food, like homemade! We went to Viuda de Vacas on the recommendation of the owner of the apartment where we were staying in Madrid and really enjoyed our mail. We went at lunchtime and the restaurant was fairly quiet. We liked the ambience of the restaurant which felt authentic and local rather than touristy. We received very good service and the quality of the food was excellent. We particularly enjoyed the oxtail stew which seems to be a favourite for customers. Good food & good location to know well La Latina !! I can really recommend this restaurant. It is in a quiet street very near to Cava Baja. I was there for my third time and the food was always perfect - I really enjoyed it. Great and innovative cuisine. Loved the dishes and the staff was kind and dedicated. Liked it a lot and will gladly go back!